One of only four recorded latte sites on the northeastern coast of Guam; Pågat (which means to counsel or advise in the Chamorro language) is an important cultural resource for the Chamorro people; the indigenous people of the Mariana Islands. The archeological site contains the remnants of a large latte village that is believed to have been a part of a larger exchange network. The area has been included on Guam Register of Historic Places as well as the National Register of Historic Places, since 1974. These designations by the Guam Department of Parks and Recreation and the US National Park Service attest to the historic significance of the site. In 2010, the National Trust for Historic Preservation included Pågat on America’s 11 Most Endangered Historic Places. Today local healers continue to visit Pågat to seek advice from the spirits and collect herbs for medicines. Fishermen still frequent this coastline, and many others hike in to learn about Guam’s past or to simply reflect on Guam’s heritage and be inspired by the spectacular scenery. Teachers and camp counselors take students and campers there often for field trips. Because Pågat was occupied before, during and after the arrival of the Spanish, one of the most important events in the history of the Mariana Islands, the significance to cultural historians and archeologists is of paramount importance. This site continues to this day to be an important archeological resource. Pågat, along with Nisichau (Nisi’an), Pigpug (Pipok), and Merizo was one of four church parishes that Guam was partitioned into in 1672 shortly after the introduction of Christianity to the Marianas. A wooden church was erected in Pågat in January 1672 although it was apparently destroyed during warfare between Chamorros and the Spanish. There appear to be no records of the church having been rebuilt. Pågat is located on a natural limestone bench about 50 – 70 meters inland from the north east coast of Guam and is bordered on the north by high steep cliffs. Pågat is one of four recorded latte sites along the entire northeast coast of Guam. A source of freshwater exists in caverns towards the western edge of the site. Archeological evidence suggests that occupation of the site began about 900 years ago. A large, permanent latte village developed on a relatively isolated limestone bench and continued to be occupied until the 16th or even 17th century. Given the limited range of resources in the immediate environs of the site and the relatively ‘expensive’ (in terms of energy expended) nature of most procurement and processing activities, it is unlikely that the inhabitants of Pågat existed as an isolated settlement. The presence of ‘exotic’ items such as volcanic stone demonstrates that this village was part of a larger exchange network. • It was a large settlement, occupied over a long period of time in a marginal environment. This could only be accomplished if it was part of an established exchange network. • Occupation at the site overlaps an important historical event in Marianas history: the arrival of the Spanish. • Despite the amount of fieldwork conducted at the site, Pågat remains an important source of archeological information. Fred Reinman first recorded the Pågat site in 1965 as part of his island wide survey. He described the site as a “relatively large latte village” containing latte, stone mortars, rockshelters and “mounds of living debris.” In 1974 Reinman returned to Pågat and conducted a further study of the site, which included test excavations. 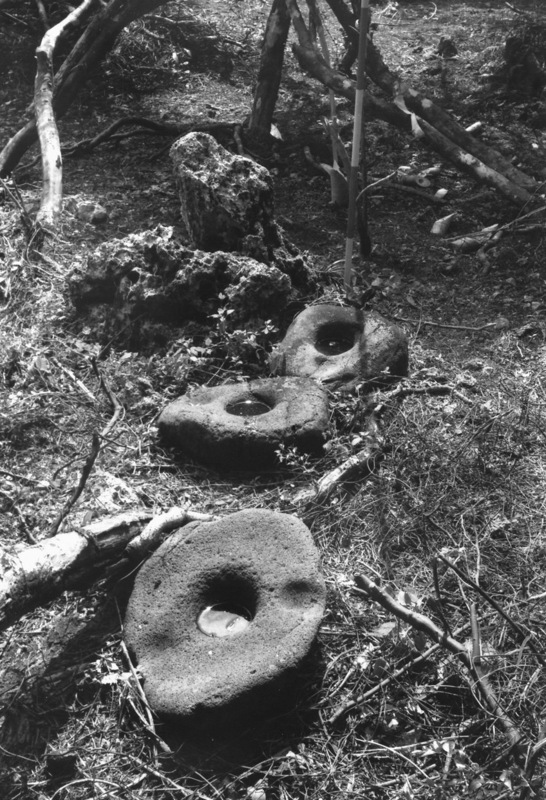 The Guam Territorial Archeology Laboratory performed additional fieldwork at the site in 1981-82. Participating with the Lab was John L. Craib who incorporated results of this work into his doctoral dissertation. This fieldwork involved the production of a detailed map of the site (Pagat Site Map) in addition to an extensive surface collection and test excavations. There were at least fifteen latte sets at Pågat. Latte components – pillars and capstones – are found in areas across the site. Most components tend to occur in general clusters; these were given the designation “Latte Area” and numbered sequentially from east to west. Two latte, located towards the center of the site, were the most intact, each had several pillars in an upright position. One (PGT-1) was an eight-pillar set; the other (PGT-2) had twelve pillars. LA2 (initially designated as EDL by Reinman) has four upright pillars. Fifty stone mortars were recorded at Pågat during the 1981-1982 fieldwork. Fifteen of these were created from local limestone outcrops. The other thirty-five were large, flat, somewhat circular slabs of basalt (see Images, Basalt mortars). The original inhabitants would have brought all of the basalt mortars to the Pågat site. The volcanic stone from which these artifacts were made does not occur naturally in the local area around Pågat. Given the weight (estimated range 25-50 kg or 55-110 lbs) of these mortars and the steep terrain around Pågat, the transport of the mortars would have involved a considerable amount of energy, attesting to the importance these processing features held to the inhabitants of the site. The boundaries of the Pågat site are well defined in terms of the distribution of latte and mortars. The occurrence of surface artifacts extends only a short (less than 30 meters) distance beyond these features. There is a consistency in the densities of surface artifacts, with virtually all clustering in and around latte; this pattern is found for all artifact classes. An important implication of this patterning is that the distribution of cultural materials is so closely related with latte areas that using only maps showing the surface distribution of cultural materials, the locations of latte could be accurately predicted. Test excavations have occurred at various points across the site and have sampled several features (Table 1). Nearly all excavations were performed prior to the 1981-82 fieldwork. Additional excavation was also conducted within Latte Area 2 (or EDL). Most of the cultural deposit at Pågat is relatively shallow, averaging about 50 cm (20 inches) in depth, and consists of a single cultural and geological stratum sitting directly upon the limestone bench. This stratum was found in all excavations at the site. However, in nearly 30 percent of the test pits a second stratum was found and excavated to a depth of about 1.5 meters. Stratum I, consisting of black friable clay, is where the majority of artifacts were found. Ceramics recovered from this stratum were identified as VST (volcanic sand tempered) and are associated with the Latte Period (AD 800-1700) occupation of the site. Stratum II is a layer of yellow-brown sandy gravel of limestone pebbles. Few artifacts, other than CST (calcareous sand temper) pottery were found in this stratum. The areal extent of Stratum II is estimated to be about 2,000 square meters, based on the locations of four test pits in which this stratum was found. A chronological outline for the habitation at Pågat is emerging, based on six radiocarbon dates (Table 2). The general pattern shows a firm cluster of dates within the Latte Period (Horizon I) of Ancient Guam. The five dates from Stratum I suggest a maximum age range between about 300 – 900 years ago (AD 1080-1640). This horizon spans the period of contact with the Spanish; the youngest date roughly coincides with the arrival of Spanish missionaries and subsequent resettlement of Chamorros. A single date from the base of Stratum II suggests that the site was initially occupied between 800-1,000 years ago (Horizon II), immediately prior to the Latte period. It is presently unclear if Chamorro occupation of Pågat was continuous over a span of about 700 years or if there was a break between Horizons I and II. Regardless, it appears as if occupation of the area ended shortly after the Spanish first came to settle in the Marianas in 1668. In general, the artifact sample from Pågat is typical of Latte Period sites. Pottery is abundant and adzes are a common artifact class. A total of 759 non-ceramic artifacts have been recovered from the 1974 and 1981-82 fieldwork at Pågat (Table 3). In addition, nearly 600 kilograms (1,300 lbs) of pottery was collected; most (65 percent) of this came from the surface. More than 6 kilograms (13 lbs) of flaked stone was also found. 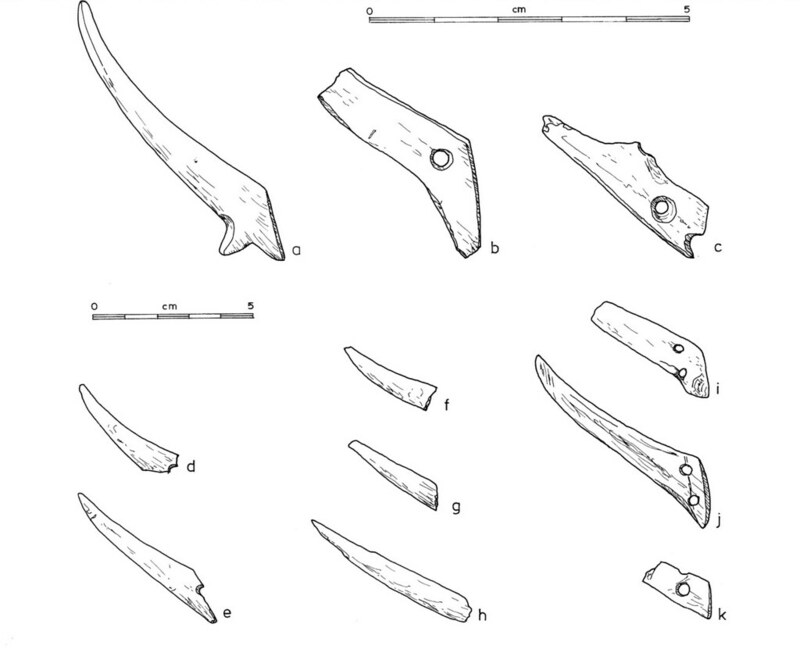 The more unique artifact classes found at Pågat includes 14 trolling lure points (Figure 3) and 79 whole and fragmentary ‘needles’ (Figure 4). All of the artifacts in these two classes were made from bone and were found in Horizon I deposits. Based on comparisons of an unfinished point and two nearly completed points with intact fish vertebrae these artifacts appear to have been made from a portion of the vertebrae of a large, pelagic fish, most likely mahimahi (dolphin fish), the very fish these points were used to catch. Most of the bone needles are fragments; only two complete examples were found. All were recovered from Horizon I deposits. While these artifacts were made of bone, it is not possible to positively identify the source of the bone because most needles have been ground and polished into shape. However, given the lack of land mammals (other than humans) in the Marianas before the arrival of the Spanish, and the length of these tools (up to 15 cm), the possible sources of bone can be narrowed to humans, turtle and cetaceans (e.g. dolphins). Reinman proposed that the initial activities at Pågat centered around generalized collecting and/or turtle hunting. The high density of ecofacts (i.e. bone) and a low artifact density support his interpretation. Bone from Horizon II is composed entirely of fish and turtle. During Horizon I, the focus remained on marine resources although there is evidence of a widening range of resources being used. The presence of 50 mortars and stone pounders at the site implies that food processing was an important activity. While mortars were used to process a variety of materials, Pågat’s location in an area where Cycads were abundant suggests these items were being harvested and prepared. Virtually all (93 percent by weight) of bone recovered from excavations at Pågat were fish; the remaining 7 percent included avifauna (bird and fruit bat), turtle and rat. The sample of fish bones represented nearly 200 individual fish, based on the calculated MNI (minimal number of individuals). Most (86 percent) were inshore species, such as Triggerfish (Balistidae), Parrotfish (Scaridae) and Emperor (Lethrinidae). Most impressive was the presence of the deep-sea (pelagic) fish, Mahimahi (Coryphena hippurus) and Black Marlin (Istiophoridae). Cooke, E. A Voyage to the South Sea and Round the World in the years 1708-1711. New York: Da Capo Press, 1712. Craib, John L. “Cases de los Antiguous: Social Differentiation in Protohistoric Chamorro Society, Marianas Islands.” PhD diss., University of Sydney, AUS 1986. Frtiz, Georg The Chamorro: A History and Ethnography of the Mariana Islands. Saipan. CNMI Division of Historic Preservation, 2001. Haynes, Douglas E. and William L. Wuerch. Historical Survey of the Spanish Mission Sites on Guam 1669-1800. 2ndedition. Mangilao, Guam: Micronesian Area Research Center, University of Guam, 1992. National Trust for Historic Preservation. America’s 11 Most Endangered Historic Places: Pågat. Accessed 24 July 2012. Reinman, Fred “Preliminary Report of the Pagat Site.”Manuscript on file, Territorial Archaeology Laboratory, University of Guam. Reinman, Fred. An Archaeological Survey and Preliminary Test Excavations on the Island of Guam, Mariana Islands, 1965-1966. Mangilao, GU: University of Guam Richard F. Taitano Micronesian Area Research Center, 1977. Save Pågat Village. Accessed 24 July 2012.